Washington (CNN) President Donald Trump's lawyers are preparing for a legal showdown with special counsel Robert Mueller, according to sources familiar with their thinking. Trump's legal team is bracing for the dramatic possibility that Mueller would subpoena the President, setting up a collision that could force a lengthy court fight and test the legal limits of the President's power all the way up to the Supreme Court. Mueller has raised the possibility of a presidential subpoena in at least one meeting, according to two sources. But some of the President's legal advisers are gambling that Mueller would not go that far. The Washington Post first reported on the subpoena threat. The already slim chances of Trump sitting for a voluntary interview with Mueller's investigators are growing dimmer, sources close to the President say. Asked whether the President would ever plead the Fifth Amendment to avoid answering questions, two sources said the legal team believes there are many "constitutional challenges" that would need to be met before that possibility even would be considered. Trump's lawyers are careful to say that the President hasn't shut the door to a possible agreement for an interview. His new legal team is still assessing that before making a recommendation, sources say. The leaking of a version of Mueller's potential questions for the President, first published by The New York Times, and the President's reaction on Twitter underscore where the issue is moving, sources say. Trump himself has told reporters he'd speak with the special counsel, and the President's legal team initially claimed that an interview could happen under the right terms. The President's lawyers said they wanted to finish the interview quickly, claiming it would help end the special counsel's investigation. But after the April 9 raid of his personal attorney, Michael Cohen, the President's view of sitting down with Mueller had a "seismic shift," according to one source -- from yes toward no. Many legal observers believe that if Mueller issues a grand jury subpoena for Trump's testimony, the courts will order the President to comply, because the Supreme Court has repeatedly ordered presidents to comply with subpoenas. During independent counsel Kenneth Starr's investigation of President Bill Clinton related to Monica Lewinsky, prosecutors eventually subpoenaed the president for grand jury testimony. Clinton's lawyers attempted to delay Clinton from speaking to prosecutors for months and told a federal judge they would avoid arguing the issue in court. They ultimately agreed to let Clinton appear before the grand jury without the weight of a subpoena. In 1974, in United States v. Nixon, the Justices unanimously directed President Richard Nixon to comply with a criminal trial subpoena for the White House tapes. And in 1997, in Clinton v. Jones, the Court directed Clinton to comply with a subpoena for his deposition in Paula Jones' civil sexual harassment lawsuit against him. Yet if Mueller attempts to force Trump to testify under subpoena -- as many legal analysts suspect could happen -- the sources familiar with the thinking of Trump's legal team say they believe Trump could successfully challenge the subpoena all the way to the Supreme Court. One of the sources says the legal team views a subpoena for a presidential interview as "precipitating a constitutional crisis." The Trump team's legal argument, according to multiple sources, is that they believe the special counsel does not have the authority to force a President to appear before a grand jury. They also believe that Article II of the Constitution, which defines the office of the President, prevents the high court from ordering an investigation into the President's use of his executive powers. In this case, that could include the hiring and firing of persons like former national security adviser Michael Flynn and ex-FBI Director James Comey. Their political argument also has changed. While the lawyers were originally in a let's-get-this-over-with mode, they now believe that time is on their side -- especially with the 2018 elections looming. They believe that Trump has done a good job discrediting the investigators and the investigation itself. Barrack's spokeswoman, Lisa Baker, declined to comment. Washington (CNN) Former Trump campaign chairman Paul Manafort will await his trial for foreign lobbying charges from jail. Two weeks after special counsel Robert Mueller's prosecutors dropped new accusations of witness tampering on him, US District Judge Amy Berman Jackson on Friday revoked Manafort's bail, which had allowed him to live in his Alexandria, Virginia, apartment under house arrest. The order marked an end to almost eight months of attempts by Manafort to lighten his house arrest restrictions after he was charged and pleaded not guilty to foreign lobbying violations. "The harm in this case is harm to the administration of justice and harm to the integrity of the court's system," Berman Jackson told Manafort in court. The judge emphasized to Manafort how she could not make enough rulings to keep him from speaking improperly with witnesses, after he had used multiple text messaging apps and called a potential witness on an Italian cellphone. "This is not middle school. I can't take his cellphone," she said of Manafort. "I thought about this long and hard, Mr. Manafort. I have no appetite for this." Manafort also entered a not guilty plea to two additional charges levied against him last week, of witness tampering and conspiracy to obstruct justice. In total, he faces seven criminal charges in DC federal court. Three US marshals led Manafort out of the packed courtroom into the prisoner holding area immediately after the judge's ruling. He was not placed in handcuffs. Before he disappeared through the door, he turned toward his wife and supporters and gave a stilted wave. Minutes later, a marshal returned to give Manafort's wife, Kathleen, still standing in the courtroom's front row, his wallet, belt and the burgundy tie he wore Friday. Court marshals held Manafort in the bowels of the courthouse for several hours following the hearing as they considered how to keep him protected from other inmates behind bars. He arrived about 8 p.m. at the Northern Neck Regional Jail in Warsaw, Virginia, 90 miles south of Washington. In a tweet, President Donald Trump said the decision to revoke Manafort's bail was "tough," although he referred to it as a "sentence." "Wow, what a tough sentence for Paul Manafort, who has represented Ronald Reagan, Bob Dole and many other top political people and campaigns. Didn't know Manafort was the head of the Mob. What about Comey and Crooked Hillary and all of the others? Very unfair!" "This hearing is not about politics, is not about conduct of the office of the special counsel." When Manafort was first arraigned and pleaded not guilty in October, a magistrate judge set a $10 million bail price and placed him under house arrest, confiscating his passports. Manafort then attempted to find assets of his own and through real estate and family members' accounts. In December, the judge signed off on his plan -- provided he could supply the correct documentation. It didn't come through, according to the court filings. Prosecutors have argued all along that the jet-setting political consultant was a significant flight risk. As the process to negotiate his bail dragged on, prosecutors discovered possible mortgage fraud related to some of the properties he hoped to use as bail. That's when they finalized additional federal criminal charges against him in Virginia. In the past month, Manafort finally came up with a plan to post some of his own and others' properties for his bail. The prosecutors appeared to agree with the plan, according to court filings. Then, last week, Mueller's team alleged they found evidence Manafort had tried to coach potential witnesses. On Friday, they told the judge Manafort was a "danger to the community" and that he had committed a crime while out on release: obstruction of justice. A man was driving with his wife through rural Italy when his phone rang. Manafort identified himself to the man, Alan Friedman, a public relations consultant he once worked with. "I need to give you a heads up about Hapsburg," Manafort told him three times. "Have you seen any article about Hapsburg?" Manafort was referring to a project he and Friedman had worked on years ago to bring influential Europeans to the US to push pro-Ukrainian politics while the group posed as independent experts. The project, dubbed the Hapsburg group, was among Manafort's efforts to skirt foreign lobbying laws, prosecutors allege. Friedman turned down the radio as Manafort spoke, Andres said, then hung up the phone a minute and a half into the call. Manafort tried several more times to reach him in the following days. Andres said prosecutors now know Manafort used multiple ways to communicate with former colleagues like Friedman and Konstantin Kilimnik, a Moscow-based associate who's also charged in the alleged witness tampering: In addition to phone calls and half a dozen encrypted messaging apps, Manafort uses a system with email called "foldering," where multiple people have access to an account and write messages to one another as drafts,but the emails are never sent. "This was a sustained campaign over a five-week period to use multiple numbers, applications and people," Andres said in court about the witness tampering allegations. Manafort's lawyer Richard Westling argued that Manafort had no way to know Friedman would be a witness in the case. Westling asked the judge to simply issue a more specific order for Manafort to follow while out on bail. "This will not happen again," Westling said. But the witness tampering allegations, which also resulted in new criminal charges, were enough Friday for Manafort to lose his house arrest privileges. Manafort has maintained his innocence and vowed to fight the charges since he was indicted alongside Gates in late October. Gates has since changed his plea to guilty and agreed to help prosecutors, because of the significant cost of his legal fees and attention bearing down on him and his family. Another associate of Manafort's, Kilimnik, was charged with witness tampering and has not yet appeared in court. Prosecutors haven't tied Manafort, Gates and Kilimnik's alleged wrongdoings to the actions of the Trump campaign, which is at the core of Mueller's investigation. However, prosecutors have said in several previous court filings that they are looking into Manafort's contacts with Russians and Ukrainians -- including Kilimnik -- and possible coordination he may have orchestrated with them while he oversaw the campaign. Manafort had spent his days since October stuck in his apartment under court order. He could leave only for legal meetings, medical needs and religious observances. The judge had allowed him to travel a few times for special exceptions, such as to his father-in-law's funeral on Long Island and his grandson's baptism in Virginia. He wore ankle bracelets that tracked his movements through GPS technology, one on each leg. Leading up to Friday's hearing, Manafort was optimistic he would avoid jail, according to a source familiar with the situation, but he and his legal team expected Mueller's team to be as aggressive as possible. His friends were "shellshocked" in the wake of the judge's decision Friday, the source said. Manafort's new confines create another hurdle in his trial preparations and will make it more difficult for him to confer with his counsel and prepare his defense. (CNN) Michael Cohen, the President's former fixer and ultimate loyalist, is sending a clear signal to President Donald Trump and his attorney, Rudy Giuliani, that "the truth is not you(r) or your client's friend," according to sources with knowledge of Cohen's thinking. It is his most direct statement so far on the reason for Donald Trump Jr's meeting with Kremlin-linked lawyer Natalia Veselnitskaya in June 2016. Special Counsel Robert Mueller is investigating US intelligence findings that Russians conspired to sway the election in Mr Trump's favour. He has called the ongoing investigations in the US "the greatest political witch hunt in history". Russia has repeatedly denied claims it interfered in the November 2016 presidential elections, where Mr Trump defeated Democratic rival Hillary Clinton. 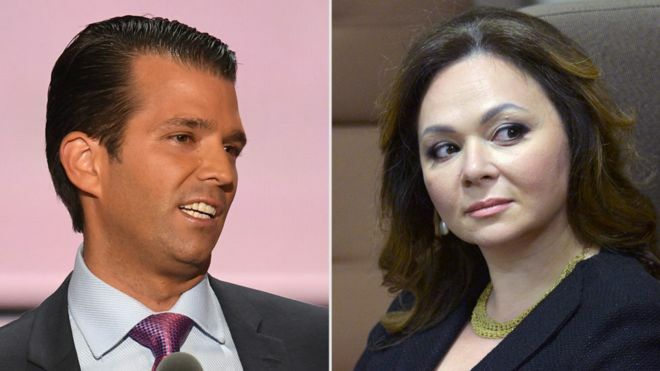 On Sunday, US media including the Washington Post, CNN and AP reported that Mr Trump was worried Donald Trump Jr could be in legal trouble because of the 9 June 2016 meeting with Ms Veselnitskaya. They cited multiple unnamed sources. Mr Trump responded: "Fake News reporting, a complete fabrication, that I am concerned about the meeting my wonderful son, Donald, had in Trump Tower. "This was a meeting to get information on an opponent, totally legal and done all the time in politics - and it went nowhere. Why does his tweet matter? When the meeting was first reported by the New York Times, Donald Trump Jr said in a statement that he and Ms Veselnitskaya had mostly discussed a suspended programme for Americans to adopt Russian children. However, he subsequently admitted he had agreed to the meeting after being told he would be offered information that would prove detrimental to Mrs Clinton. He also released the email exchange that brought about the meeting. US commentators have argued that Mr Trump's new admission that the meeting was to gain information about Mrs Clinton shows that the earlier statement was misleading. Why is the Trump Tower meeting controversial? It is common for US politicians to research their opponents during a campaign. His apparently enthusiastic response to the offer of information about Mrs Clinton could also breach conspiracy laws. The Trump team has argued that Mr Trump Jr ultimately did not receive any damaging information about Mrs Clinton at the meeting. One of Mr Trump's lawyers, Jay Sekulow, said on Sunday that the meeting had nor broken any laws. "The question is what law, statute or rule or regulation's been violated? Nobody's pointed to one," Mr Sekulow told ABC News.